Garden Curiosities, Fact or Fiction? Clear the garden of remaining vegetation. Apply and integrate compost or manure if you have not already done so. Seed some whole oats on any open areas. Increase the seeding rate as the month progresses. If it’s too late to seed a cover crop, consider spreading a layer straw over the tilled area. Plant dormant perennials like trees and shrubs as there may be some very good deals on these plants at your local garden center. 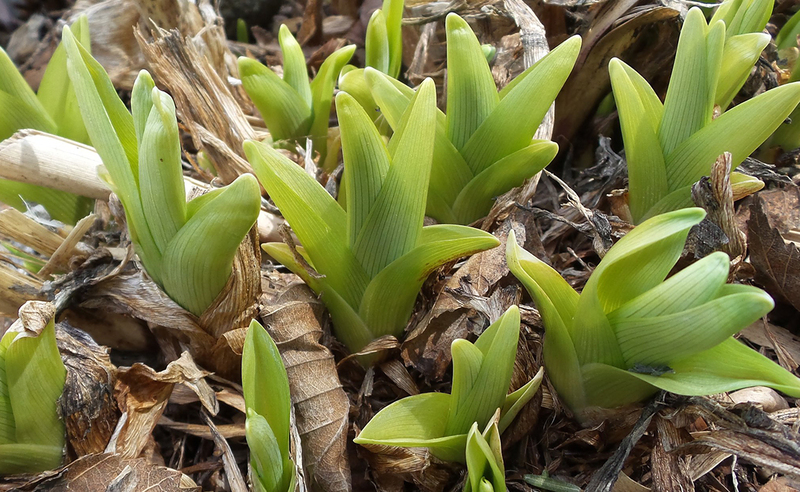 We’ve reached an average daily temp of below 60 degrees F, so bulb planting may start. 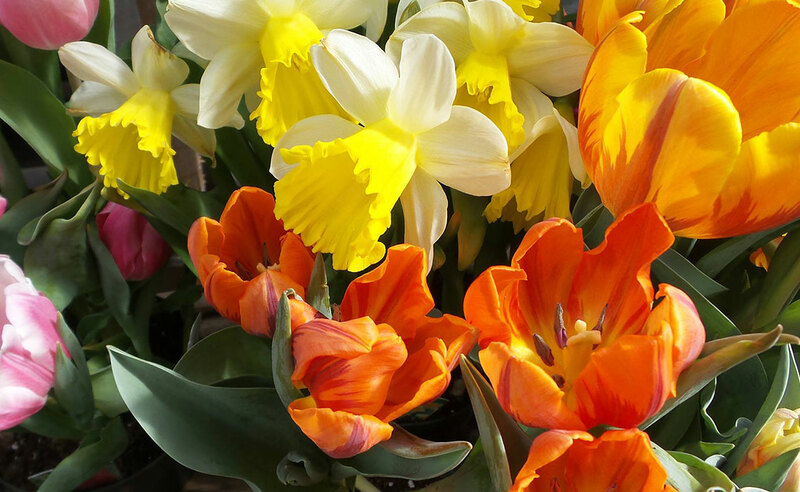 Plant hardy bulbs such as tulips, daffodils, crocus, hyacinth, muscari and scilla. Shop early to get the best selection. Many bulbs are sold in open bins; the later you wait, the more they are apt to be mixed up. Continue to mow your lawn until it stops growing. Mow at its regular height. If you rake leaves, add them to your compost piles. Consider having a preventative maintenance checkup for your lawn mower. Empty garden hoses, replace hose washers, roll the hoses up, and store them inside for the winter. Sharpen pruning saws, shears, and blades. Spray cutting surfaces with a thin coat of oil before storing for winter. Take clay pots inside for the winter to avoid them cracking. Evaluate the garden and yard. Make note of what needs to be improved. Act on correcting any hazardous situations in your yard. It’s too late to divide plants, but if there are plants that need to be divided, place a stake or marker to recognize these next spring. The best time to divide plants is early spring because of coolness, adequate soil moisture, and the plants are ready to grow at that time. Think about what you want to divide and do your marking now. Wrap the trunks of young fruit trees with plastic mouse guards or hardware cloth. When using hardware cloth, provide an adequate space for tree trunk growth as the hardware cloth is typically left in place throughout the year. Plastic guards are snug against the trunk through the fall and winter and are removed in the spring and summer. If chainsaws are to be used for bucking up firewood or felling trees, make sure the saw and chains are in good working order. Operators should have proper personal protective equipment such as hardhat, eye protection, earmuffs, chaps, and proper footwear. Review chainsaw safety guidelines in Bulletin #2353, Chain Saw Safety. Be ready for mice with proper control measures. Mice seek a safe winter harborage at this time of year. Your home, barn, shed, and garage can be preferred destinations for them. For more information, see eXtension’s White-footed and Deer Mice Damage Management. 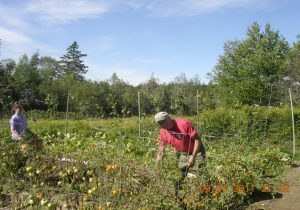 Master Gardener Volunteers Tom McIntyre and Sarah Day Levesque harvest crops at Sweet Haven Farm for donation to Mount Desert Island congregate living centers. Early in February, the grow lights flicker on and seedlings for the Harvest for Hunger project are started; onions and leeks come first. Over the next couple of months, plantings are staged according to how long it takes the plants to be ready to transplant into the gardens. As soon as feasible, the hoop house and cold frames are employed to hold the seedlings while they mature. In May, volunteer workers start to come several days each week to prepare the garden plots. They add soil amendments according to the soil tests and mix in the required minerals and nutrients using hand tools. They put down weed deterring mulch in the walkways, and plant seeds and seedlings. 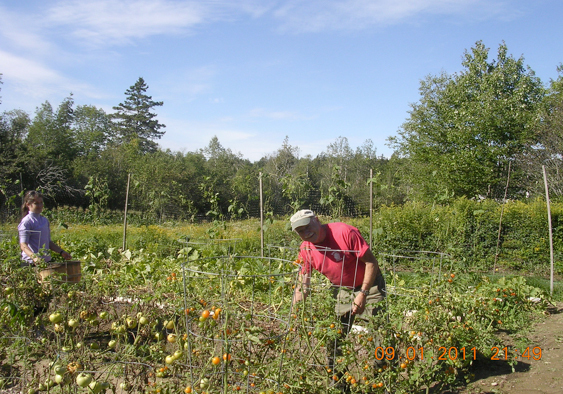 The harvest will provide fresh produce for congregate living centers around Mount Desert Island. Things begin to come up in June and by mid-June, lettuce, Swiss chard, spinach, green onions, and other early crops are ready for volunteers to harvest and deliver to the various sites that are the target users of Sweet Haven Farm produce. Volunteers continue to weed, plant, and maintain the gardens throughout the summer. We have 4,000 square feet of growing space devoted to this project. We try out various organic methods of protecting crops from insects and disease. We try new varieties of standard crops. We all work hard at making the gardens a showplace for crop maintenance and succession planting. We work at having plots fallow as short a time as possible. We exchange ideas as we work; we are always experimenting and trying to improve our crop yields. The goal is to provide good tasting and nutritious vegetables that are chemical free to as many people in need as possible. We delivered 1,000 pounds of vegetables last year and plan to exceed that poundage this year. At the beginning and the end of the growing season, we have a luncheon to discuss our plans, our successes, and ways to improve. 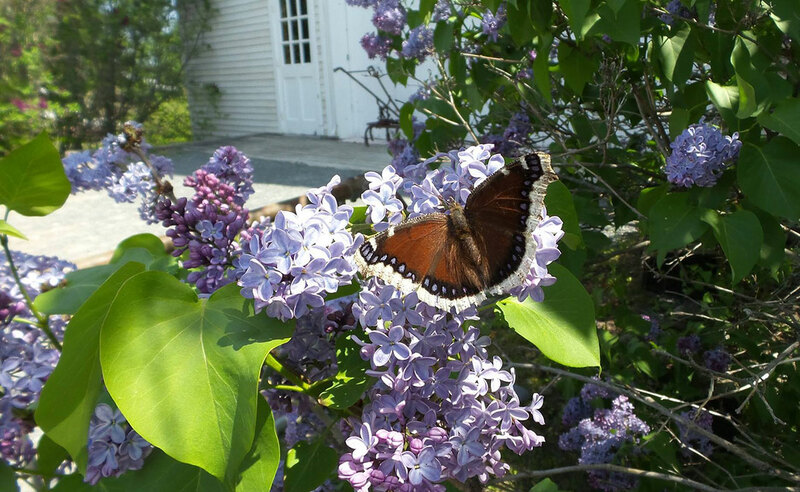 The people who make this possible are a combination of University of Maine Cooperative Extension Master Gardeners and community volunteers. The Volunteers are: Jean Howell, Sarah Day Lavesque, Tom McIntyre, Kay Woody, Jennifer Wright, Torie Hallock, Steve Keiser, Pam Mitchell Dakota Strassner, Heidi Welch, Cass Wright, Muriel Davisson, Cecilia Schmidt, Eva Eicher, and Dorcas Corrow. By Mark Hutchinson, Extension Professor, University of Maine Cooperative Extension, Knox and Lincoln Counties, mhutch@maine.edu. My garden in the fall is as busy as in the spring. I spend time removing any weeds that have grown under the canopy of the crop to prevent any additions to the soil weed seed bank. It is also a time to plant cover crops to conserve the soil and retain any plant available nutrients in the soil. However, before planting a cover crop is a good time to add compost. Compost is a very good soil amendment. One function of compost is to increase the soil organic matter, which provides food for the soil biological community. Healthy soil has a very dynamic and diverse microbial population, which is beneficial to the health of your plants. By adding compost in the fall, you ensure a wealth of food for the biological community late into the fall and early spring. Just like most things in life, too much of a good thing is not good. Over-application of compost can cause soil nutrient levels to become excessive, especially phosphorous and potassium. Most home gardeners tend to use too much compost in their gardens. Small numerous applications of compost will improve the long term health of the soil better than one large single application. The soil community can only process a limited amount of food at one time, so feed them slowly and often. So how much compost should be added? Many recommendations suggest 1 or 2 inches of compost; this equals between 60 and 80 cubic yards per acre. This is an excessive amount of compost! Compost should be applied so you can barely see the compost on the soil surface (think about pepper on mashed potatoes!). Though it appears to be very little, the soil biological community will maximize the available food. The compost does not need to be incorporated into the soil. Earthworms and other organisms will carry the organic matter into their holes. This activity will also help maintain the soil structure. Remember that all composts are not created equal. If you have been composting all summer, some of the compost in your bin may still be immature. Immature compost can cause negative impacts on plant growth. Immature compost applied in the fall, however, is not an issue because the compost will mature before spring planting with the help of the soil organisms. 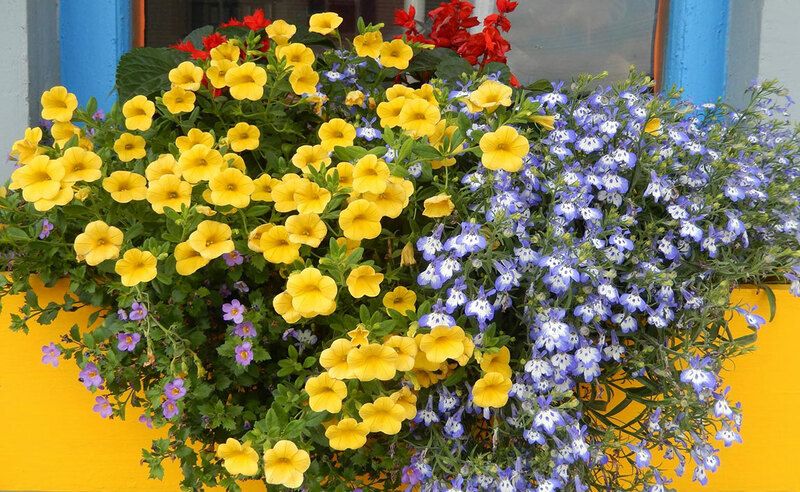 Note: Immature compost should never be used in potting mixes or for potted plants as unfinished compost produces phytotoxins, which can damage plants. This affect is more pronounced in containers and potting mixes because there is less dilution than in field soils. Fall is also a good time to prepare for winter composting. One way to continue composting through the winter is to collect leaves in a large wire or wood slotted container (4’x4’x4’). The container should be placed in a convenient local with good southern exposure (think about trudging through the snow). Kitchen scraps can be added throughout the winter by moving leaves to the side, placing the food material in the leaves and recovering. The key is to make sure the kitchen scraps are well covered with leaves to prevent any vector issues, a minimum of 12 inches. A wire mesh cover can also be helpful in controlling vectors. Additional leaves can be stored in plastic garbage bags and be added to the bin as the leaves and food compost. It is easier to add food waste if the bin is full of leaves. 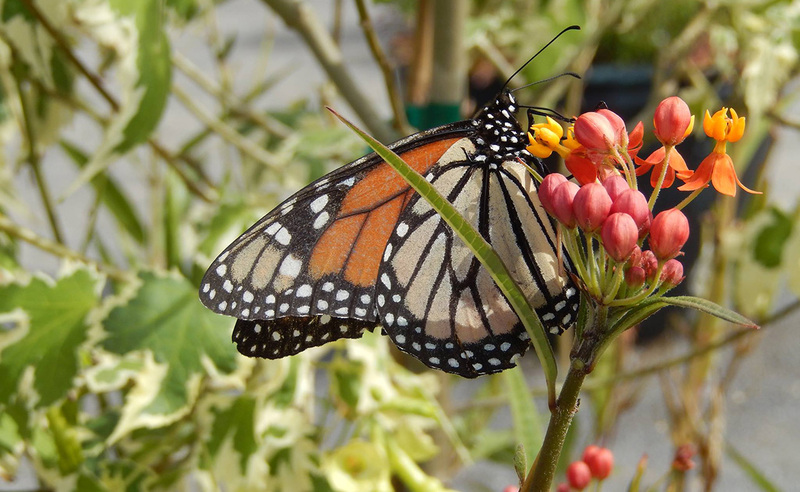 In the spring, the material can be added directly to the garden or continue to compost during the summer and added in the fall. Compost and organic matter are critical components of healthy garden soils. Just remember that too much of a good thing usually has a negative effect. Think small quantities often when it comes to compost applications. Hanson, Beth-Editor, Easy Compost. Brooklyn, New York, 2005. Martin, Deborah L., Gershuny, Grace-Editors, The Rodale Book of Composting. Emmaus, Pennsylvania, 1992. Pleasant, Barbara, Martin, Deborah L., The Complete Compost Gardening Guide. North Adams, Massachusetts, 2008. By Kathryn Hopkins, Extension Educator, UMaine Extension, Somerset County, khopkins@maine.edu. One day, a person brought in this plant and asked, “I saw this unusual plant and would like to buy one. What is it?” It was a bit hard to tell what the plant originally was and here is the explanation why. Plants usually produce easily recognizable and consistent growth in their stems, leaves, flowers, and seeds. Occasionally plants produce unusual growth with odd or misshapen structures that make identification difficult. Some of the oddities that plants produce are called fasciations, galls, and chimeras. Fasciations are an abnormal flattening of plant parts, usually stems, that develop when cells at the growing tip are changed to a jagged row of cells, which continue producing jagged cells that form a wide flat stem that may also appear ribbed, like in the picture (at right). Sometimes these flattened stems grow into a coil, like this plant. 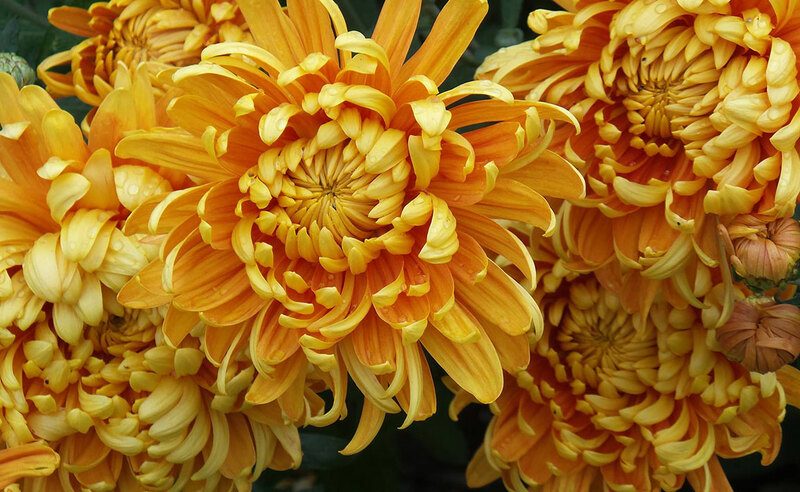 The leaves are often abnormally small and fasciations in flowers may look like two flowers fused together. Fasciations can be caused by imbalanced hormones, extreme temperature fluctuations, or insect, bacteria or virus attack. Sometimes the cause is unknown. 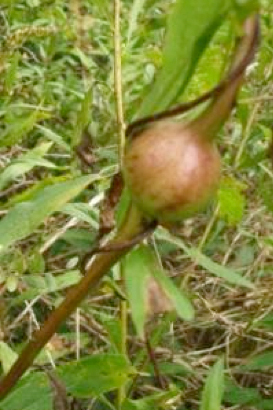 Gall on goldenrod. Photo by Kathy Hopkins. Galls are abnormal, localized swellings on the plant that may also look like tumors. On hardwood trees, these are referred to as burls. The causes of some galls are unexplained. Some are caused by the plant’s reaction to bacteria, fungi or insects. One common gall that we see in autumn is the goldenrod gall. It is a swelling caused by an insect, the Goldenrod Gall Fly, Eurosta solidaginis. 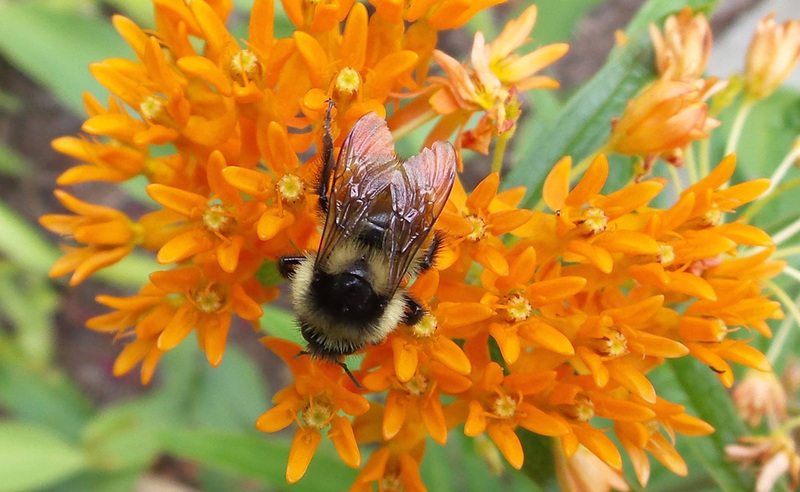 This insect spends its entire life cycle on the goldenrod plant; the swelling on the stem that you see in the picture is where the female laid an egg that hatched into a larvae. The goldenrod fly larvae has a chemical in its saliva that causes the plant to grow a round stem swelling that makes a home for the larvae for the next year. Many trees also develop galls in response to insects or diseases. Some woodworkers prize the galls from hardwood species and use them to craft beautiful burl bowls. 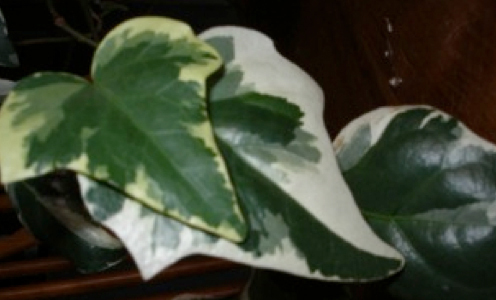 Variegated ivy. Photo by Kathy Hopkins. Chimeras are formed when some part of the genetic code of a plant cell is accidentally mutated and two or more distinctly different plant tissues overlay each other. If the mutated cells survive and continue producing new mutated cells, the plant is called a chimera, or a plant with two distinct parts. A sport is when a part of the plant shows a distinct variation from the parent. Some chimeras or sports have become valuable commercial plants. Many commercial fruits developed from a sport – a branch of fruit that was different and better than the rest of the original tree. Sometimes chimeras cause flowers or leaves to be different colors or multicolored. 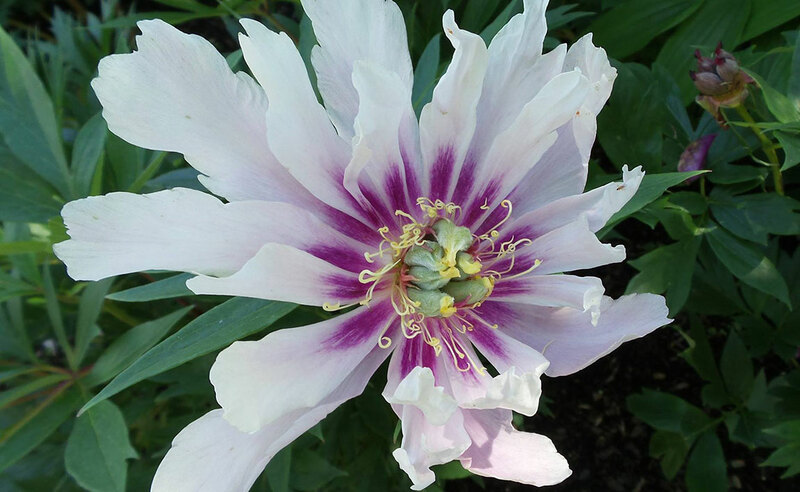 Often, new plants are produced commercially by taking cuttings from these unusual plants. Diffenbachia, Peperomia, Chlorophytum, and Saintpaulia are a few of the chimeras that have variegated foliage. If you have ever had a variegated plant that faded to a single color, it may be that the genetic code has reverted to its original color.